Rikka Inn Bangkok, centrally located on Khaosan Road, near The Temple of the Emerald Buddha, features 50 air-conditioned rooms decorated with vintage Thai memorabilia. Each room is fitted with satellite TV, mini-bar with complimentary bottled water, desk, laptop compatible safe, telephone, free Wi-Fi, as well as a private bathroom with shower, hair dryer and complimentary toiletries. 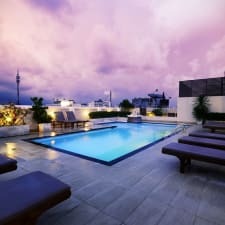 Rikka Inn Bangkok boasts an outdoor pool, rooftop terrace, ATM, convenience store and pharmacy, free Wi-Fi in all public areas, elevator, designated smoking areas, 24-hour front desk, luggage storage, and tour assistance. The surrounding area is home to several fine restaurants, cafes, and bars. The Ganesha Shrine, Phra Pin-klao Bridge, and Siam Paradise Night Bazar are easily accessible, and Khaosan road is famous for exotic nightlife and street stalls. Guests can also relax in nearby Dusit and Saranrom parks, and the Sea Life Bangkok Ocean World offers entertainment for the whole family. Many guests appreciate that there is a convenience store on-site, and love that it is open till late. Others add that there is an ATM, pharmacy and tailor shop on-site, and comment that this is a convenience especially when guests are pressed for time. Many guests comment that the rooftop terrace has a serene atmosphere, and note that the pool area has ample loungers and parasols. Others add that staff goes out of their way to ensure that guests are looked after, and appreciate that changing room is well-stocked with fresh towels. Several guests comment that the rooms are clean, and the bathroom floors are spotless. Others add that the linen is fresh, and appreciate that bathroom fixtures are modern, and shower pressure is strong. A handful of guests comment that parking in the surrounding area is limited and available spots can be some distance from the property. Others add that the manager is helpful, and assists guests locate convenient parking nearby. Some guests note that the surrounding traffic is audible in the rooms, and also comment that there is a lot of noise from the hallway. Others add that the room walls are thin, but suggest packing earplugs for a good night's rest. A handful of guests comment that the room Wi-Fi is frequently disconnecting, and the Internet speed is slow. Others add that the staff are professional and resolve connectivity issues in a timely fashion.